Surfing Heritage & Culture Center: Pillow Case Surfing! 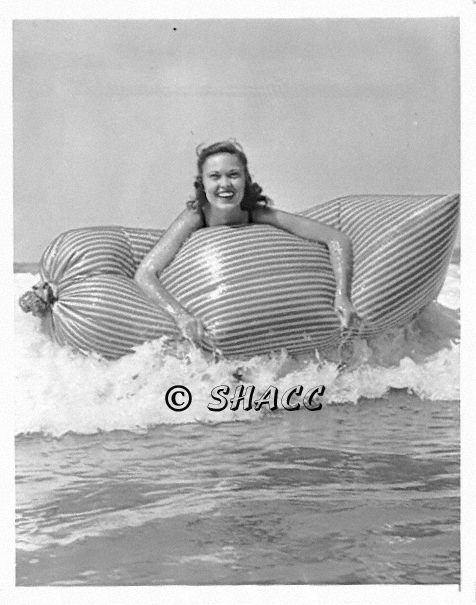 So the story goes, big pillow cases were wetted down and filled with air and used for riding the waves "back in the day." If we didn't have this picture as proof, we wouldn't believe it. And just where do you find a pillow case that big! They weren't pillowcases, they were a sheet sewn together on the bottom and sides My mother made them and we used them when we lived in a tent cabin on Huntington City Beach during the summers in the early 1950's. Cowabunga! I found this just after telling my wife about how we rode waves with these huge pillowcase-like bags made from bedsheets when I was a kid living by Pipeline , North Shore Oahu in the early sixties. My mom made them and taught the whole family how to ride them. She was raised on the beach on Maui in the 30's to 40's and must have learned to ride them there. We'd swim out with the bag collapsed and hold them up in the trade winds to fill them when we got in the lineup. You could only ride them straight toward shore but the ride was unbelievably fast! I was having a hard time explaining it to my wife and I'm stoked you had a picture of it!